Biweekly marriage proposals from men who can’t see beyond her (admittedly breathtaking) looks are starting to get on Lady Clara Fairfax’s nerves. Desperate to be something more than ornamental, she escapes to her favorite charity. When a child is in trouble, she turns to tall, dark, and annoying barrister Oliver Radford. 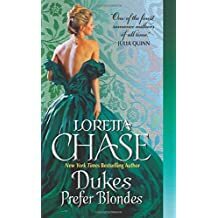 Though he’s unexpectedly found himself in line to inherit a dukedom, Radford’s never been part of fashionable society, and the blonde beauty, though not entirely bereft of brains, isn’t part of his plans. But Clara overwhelms even his infallible logic, and when wedlock looms, all he can do is try not to lose his head over her. It’s an inconvenient marriage by ordinary standards, but these two are far from ordinary. Can the ton‘s most adored heiress and London’s most difficult bachelor fall victim to their own unruly desires?